Stamps inscribed 'Kenya Uganda and Tanganyika' were valid for fiscal use in Tanganyika from 1935 until the 1960s. These are listed under East Africa and Uganda - Kenya and Uganda - KUT. Tanganyika was united with Zanzibar in 1968 to form independent Tanzania. All Stamp Duty adhesives issued since then are inscribed 'Tanganyika', and it is unclear whether they have been valid in Zanzibar. 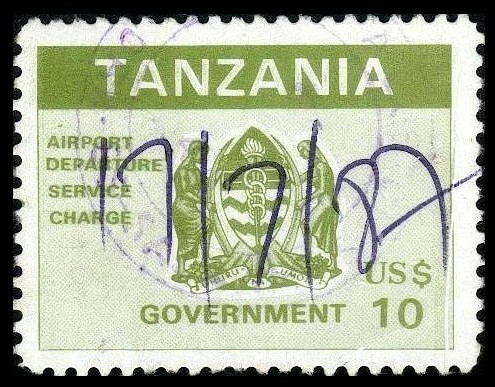 Other revenue adhesives have been inscribed either 'Tanzania' or 'Zanzibar Revolutionary Government'; the latter are listed under Zanzibar. For stamps inscribed National Savings (Weka Akiba) or Ushuru, see under Labels. Acknowledgments for Tanganyika - Tanzania can be found on the main East Africa page. ?1970s. Label approx 60 x 55 mm, inscribed TANZANIA GOVERNMENT DEPARTURE SERVICE CHARGE. Imperf. Watermark Arms of Tanzania (extending across whole label, sideways reversed). Horizontal lines of microscopic text in light brown forming security background. 1987-89 (recorded usage). Arms of Tanzania. Inscribed GOVERNMENT AIRPORT DEPARTURE SERVICE CHARGE. Perf 10½. No watermark. A11 additionally with handstamped surcharge in purple, A13 with manuscript surcharge 3 cancelling 2 in '200/-'. 1989-92 (recorded usage). Aircraft, Arms of Tanzania and airport terminal. Inscribed as before. 25½ x 36 mm. Perf 10½. No watermark. 1990-93 (recorded usage). Provisional handstamp surcharges on A21/22. Note: there is some variation in the size and format of overprints. The overprint on A31 measures approx 18 x 4 mm and is in violet, with two bars in '1000/='. The overprint on A32 is slightly smaller at 14 x 3 mm and is in black, with only one bar in 1000/-. Of the two examples I have seen of A28, one has the original values (both 500 and 800) deleted in manuscript and one does not. c1950. Stamp Duty adhesive of 1950 (King George VI portrait) overprinted Buffalo Fly Control in narrow sans-serif letters. c1963. Kodi (Coat of Arms) issue handstamped ENTER- TAINMENT TAX in three lines, in violet, seriffed, 16 x 9½ mm. c1963-70s. Small format type featuring Arms of Tanganyika, handstamped Entertainment Tax in various different fonts and styles. The handstamps can be found upright, inverted, sideways or diagonal. Note: Ellis records a block of the 1s stamp (either E11 or E31) with the handstamp omitted on one stamp (Row 9/1). c1980s (recorded usage). Similar types but surcharged E/TAX 6/- in sans-serif font. 1990 (earliest recorded usage). State Arms, inscribed GOVERNMENT ENTERTAINMENT TAX. 26 x 36 mm. Perf 10½. No watermark. An example cancelled 5 SEPT 1990 is illustrated by Gibson & Hieatt. c1990. Similar format but featuring Arms of Dar Es Salaam and inscribed DAR ES SALAAM CITY COUNCIL ENTERTAINMENT TAX. 25½ x 35½ mm. Perf 10½. No watermark. There is currently no listing here for Tanzania Excise labels but I refer readers to Andrey Vasiunin's excellent website Tax Stamps Collection. 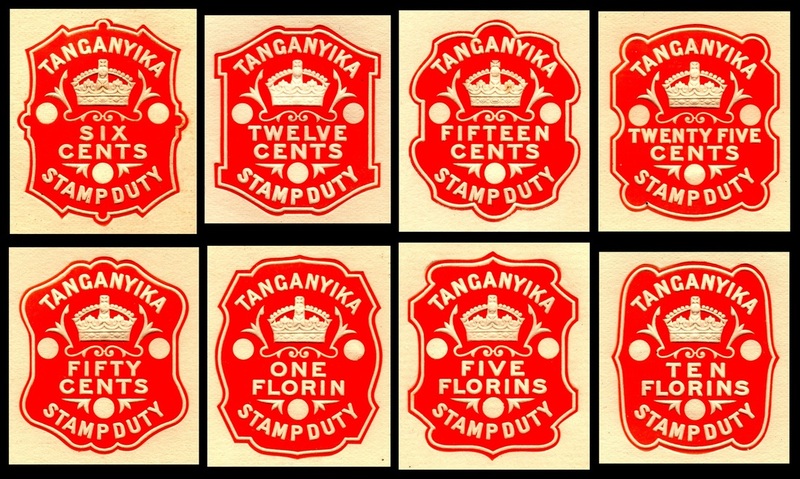 Illustrated here are proofs for impressed stamps denominated from 6 cents to 10 florins, all in vermilion. The florin was introduced on 31st July 1920 as a replacement for the East African rupee, and was replaced by the East African shilling (1 florin = 2 shillings) at the end of 1921, suggesting that these proofs were prepared during this brief period. No other examples have been recorded to date, and it is not known whether these were ever issued. 1954-62 (recorded usage). Crown and ornaments with date plugs (the year plug sideways). Inscribed TANGANYIKA STAMP DUTY. 20 x 28 mm (20c) or 29 x 38 mm (1s). ​Note: illustrated above is a master proof denominated SHILLINGS with a blank space above to allow a number to be added. Z2 was evidently produced using this die, which explains why the word SHILLINGS is plural despite being only a 1s value. 1955-59. Receipt stamps used on cheques. 1969 (recorded usage). Arms of Tanzania with date plugs. Inscribed TANGANYIKA STAMP DUTY. 18½ x 28 mm. 1934. Large Nyasa key type featuring the portrait of King George V. 25½ x 30 mm. Perf 14. Watermark Multiple Script CA. Printed (typo) by De La Rue. The first printing of this stamp was despatched to Tanganyika in August 1934, with subsequent printings being sent in July/August 1935, May/June 1936 and March 1937. The final printing (Req 1322/2) was delayed by a British constitutional crisis. When the Crown Agents commissioned the printing (25th November 1936), they specified that the stamps should feature the head of King Edward VIII, but on 10th December he abdicated and George VI became king. It was seen as inappropriate to go ahead with the Edward VIII stamps but a new George VI head plate would not be ready for some months, so on 17th December the Crown Agents wrote to De La Rue and directed that the printing should be carried out using the old King George V head plate. 1938-49. Similar type but portrait changed to King George VI, and new value (50c) in small format 18½ x 22½ mm. Perf 14. Watermark Multiple Script CA. The first perf 14 printing of the 1s was despatched to Tanganyika in October/November 1937, so it presumed that it was issued in early 1938. This was then reprinted in 1938, 1939, 1940, 1941, 1942, 1944, 1945 and 1948, then finally (with the change to perf 13) in 1950. The 50c and 5s were each printed only once, in 1938 and 1949 respectively. The existence of the 50c is known from archives, though no issued examples have yet been recorded. 1954. Similar type but portrait changed to Queen Elizabeth II. Perf 13. Watermark Multiple Script CA. Note: both stamps were printed only once, and sent to Tanganyika in October/November 1953. 1962. New type featuring the Arms of independent Tanzania. 26 x 30½ mm. Perf 12 x 11½. No watermark. Printed by Bradbury Wilkinson. Note: proofs were approved on 26th September 1962, and the first printing of all values was sent to Tanganyika on 9th January 1963. The 10s and 20s have not yet been recorded as issued stamps except the 10s overprinted for Stamp Duty. 1941 (earliest recorded usage). Defence savings fund. 21 x 27 mm. Inscribed TANGA 20 CENTS in red over WAR WEAPONS (x13) in deep blue. Perf 11. No watermark. c1960s. Tanzania National Housing Corporation Slum Clearance. Breeze block and slogan BUY A BRICK BUILD THE NATION in Swahili and English. 33 x 30 mm. Perf 14½ x 13. No watermark. I have not seen any issued examples of either of these types. c1990s. Symbol of Navigation and Arms of Tanzania. Inscribed Tanzania Government. 36 x 26 mm. Perf 10½. No watermark. 1917-21. 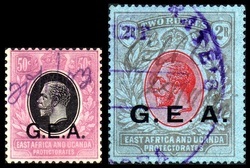 King George V stamps inscribed East Africa and Uganda Protectorates, overprinted G.E.A. for use in former German East Africa. Perf 14. Wmk Multiple Crown CA. 1. Barefoot also lists the 50r, but I have not seen this value fiscally used. 2. The images of R58w are taken from the website of Ormskirk Stamps, where the variety was discovered. 1921. As previous issue but wmk Multiple Script CA. 1922-24. Giraffe's head in ornamental frame. Inscribed Tanganyika. Cents values 16½ x 20½ mm, perf 15 x 14; others 25½ x 29½ mm, perf 14. Wmk Multiple Script CA, upright except where indicated. 1927-31. King George V stamps inscribed Mandated Territory of Tanganyika. Perf 14. Wmk Multiple Script CA. 1950. Stamp Duty key type featuring palm trees and portrait of King George VI, using the head plate from the 1937-1950 Stamp Duty series of Hong Kong. 25½ x 30 mm. Perf 13. Watermark Multiple Script CA. Printed (typo) by De La Rue. Sheets of 60. 1. The first printing of this issue was printed in December 1949, though no dispatch date is recorded in the Crown Agents Requisition books. A second printing of the 10c, 20c, 50c, 1s and 5s was sent to Tanganyika in March 1950, and a final reprint of all eight values was dispatched in June 1950. 2. Three additional values (3s, 40s and 50s) were listed in the original requisition but cancelled prior to proof stage. 3. The 2s is known postally used. Note: the 10c, 1s and 2s were first sent to Tanganyika in April/May 1954 (Req 2047/1). The other values were added later under new requisitions - 50c (Req 9310/1), 20c (Req 2230/1) and finally 5s (Req number unknown). Gibson lists a 10s value but it clear from the archives that no such denomination was issued. c1958 (according to Gibson). S14 surcharged ten cents in words, 4 x 24 mm. c1963. Kodi (Coat of Arms) issue surcharged STAMP DUTY 10 CENTS in sans-serif letters, surrounded by frame 26 x 26 mm. 1962. Small format type featuring Arms of Tanganyika. 17 x 21 mm. Perf 15 x 14. No watermark. STAMP DUTY inscription 9½ mm at lower left. Printed by Harrison. 1. The date of issue is derived from the dispatch dates for the first printing (see below). Gibson & Hieatt state that the 20s was not issued until the early 1980s (along with a new shade of the 10s) but this goes against the Req books data, which clearly show that all eight values from 10c to 20s were issued together. I suspect that the watermarked stamps (S34a, S37a and S38a) were issued later than the 1983 surcharges since the surcharged stamps are all unwatermarked. 2. Barefoot lists a 3s, but this value was never ordered. 3. The 10c is known with postal cancel. 4. Gibson & Hieatt note that these stamps (and the subsequent issues listed below) were used only in Tanganyika and not in Zanzibar, even after the unification of the two territories in 1965 to form Tanzania. 5. For higher values (50s and 100s) in a slightly redrawn design, see S51/2 below. 1983 (earliest recorded usage). Previous issue surcharged in figures 3½ mm high. c1983. Small format Arms type as S31/38 but slightly redrawn, with STAMP DUTY inscription 7½ mm at lower left. Perf 15 x 14. Wmk Script Harrison & Sons (sideways). 1985-94 (recorded imprints). Small format Arms type again redrawn. 17 x 20½ mm. Perf 10½. No watermark. Printed by the Tanzania Government Security Printing Department (imprint in lower sheet margin). Sheets 10 x 10. 1. The year of printing is shown in the sheet margins at the foot of the stamp. The following imprint dates have been recorded: 1s (1985, 1986, 1991, March 1994), 2s (1991, March 1994, September 1994), 5s (1985, 1991, March 1994), 10s (1991, December 1993), 20s (1992, September 1994). 2. S67a is a constant plate variety, occurring on the penultimate stamp in the top row of the sheet. 3. Most values are known in a wide range of shades. 4. For 500s value (as listed by Barefoot) in slightly revised type, see S91/a below. c1995. Similar type but redrawn with blank background. Perf 10½. c2000. New type similar to S61ff but with amended Coat of Arms and slightly redrawn lettering, with TANGANYIKA in shorter letters. Perf 10½. No watermark. 2018 (first recorded). As S91/a but Arms again redrawn. 16 x 19½ mm. Roulette 10. No watermark. Self-adhesive. Note: S96 was on sale at Tanzania Revenue Authority offices in October 2018.